Our FastPass+ slots on this day were in the Studios, so that’s where we started our adventures. We rode the headliner attractions we’d signed up for and took in some minor attractions on a standby basis. 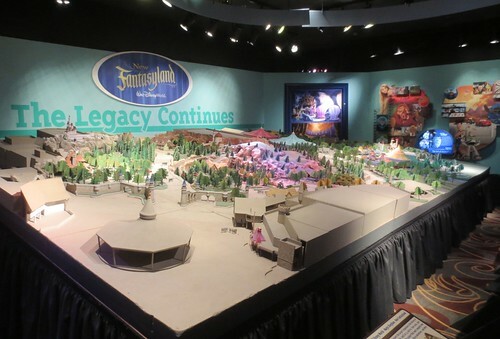 The model for new Fantasyland was on display in the One Man’s Dream attraction; I thought it was a bit silly that our first encounter with this new land was here in the Studios, when the real thing was just across the lagoon from our hotel, but that’s how the schedule shook out. We left the Studios midafternoon to go back to the hotel and get spiffed up before dinner at the Grand Floridian, one monorail stop away. 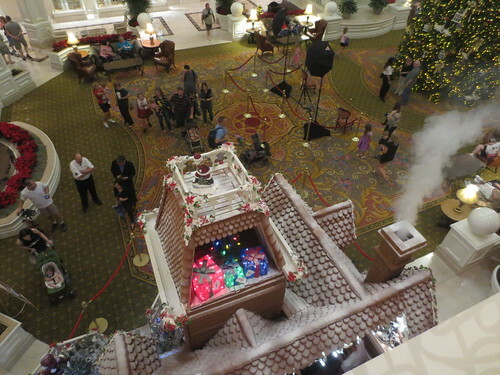 While we waited for our table, we hung out on the second floor of the huge open lobby, watching people on the main floor gaping at the huge gingerbread house (large enough that it functions as a retail location) and even more huge Christmas tree. After dinner, we monorailed back to the hotel and changed into park clothes before finally heading to the Magic Kingdom for the first time this trip. We got there in time for the Main Street Electrical Parade, which we like so much we have a framed poster of it in our home. 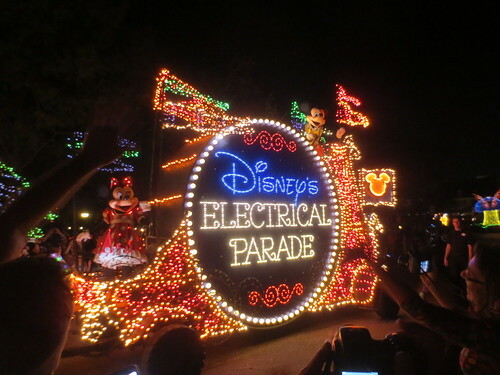 (Well, not quite; we have a poster of the original Main Street Electrical Parade, and what’s now running up Main Street is actually Disney’s Electrical Parade, but they’re close enough.) The fireworks followed soon after; we decided to not join the crowds on Main Street but rather see them from Fantasyland, which meant it was rather like watching a tennis match, with blasts going off on the castle to one side of us and at the park perimeter on the other side. We finally got into new Fantasyland and did some of the attractions, then realized there was going to be a second running of the Main Street Electrical Parade so we watched it again, because what the heck the park’s open ’til 1 a.m. and why not see the parade twice (a better planner would have known about this schedule change far sooner than I did and probably skipped the first parade to get more attractions in, but I am only a lightweight WDW vacation planner even though I do have a spreadsheet and a subscription to Touringplans.com and the Lines app on my phone). Walking to Tomorrowland after the second parade, I got distracted by someone’s flashy mouse ear hat (different than either of the flashy mouse ear hats Mr. K and I were wearing at the time) and tripped on a curb and fell down hard. My hands, one elbow, and my purse took the brunt of the impact. I made enough of a spectacle of myself that other guests stopped to check on me. Fortunately, I was mostly okay. My elbow did get scraped & bruised and the heels of my hands hurt and I felt sort of banged up all over, but not so much that I wanted to go to first aid. Once I was upright, I thought about my camera and phone, both tucked in the purse that had cushioned my fall to the pavement. I pulled out my camera and saw so many cracks in the display screen I didn’t have much hope, but it turned on, showing only a few streaks of discoloration in the LCD screen behind the glass, and seemed to still work okay. My phone fared even better, with just some small areas of discoloration in the LCD layers, and no cracking or loss of function (and both devices have stayed stable for the week plus since I damaged them, so I count myself lucky). I dusted msyelf off and we continued touring the park until closing, finishing up with the last ride on the Mad Tea Party for the day (so few people were there at that hour that we each had our own cup). Perhaps the most magical part of the day was walking out of the park past where I’d tripped about an hour and a half earlier, and Mr. Karen bending down and finding the button that had ripped off the bottom of my capris when I fell (there’s a decorative band at the hem with a buttoned flap). Oh, and since I’ve been inflicting tales of my blister on you up to this point in my trip report, I feel I must share that before this day’s touring, I finally lanced the blister with a needle and drained the fluid (I hadn’t earlier fearing infection) and it immediately felt better. I’d continue to wear a Moleskin donut around it the rest of the week, and drain it every now and then, but it really didn’t affect our touring and I won’t mention it again. 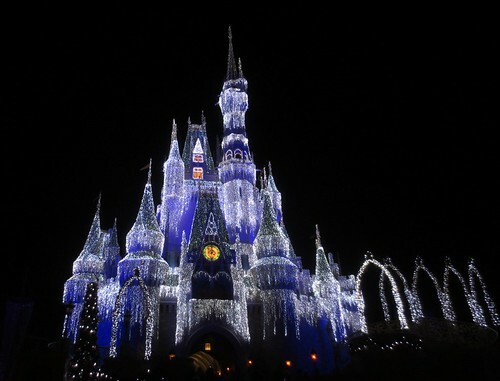 Thanks for sharing your Disney adventures!